It is an argument that the government of Malaysia, where the fraud was carried out, is not buying. “We have suffered extremely large losses and you were the financial adviser,” said Lim Guan Eng, the finance minister of Malaysia, referring to Goldman Sachs. Malaysia is gearing up for a fight with an institution that was once synonymous with power and influence around the world. The government is seeking $7.5 billion in compensation from Goldman Sachs, adding to a mounting pile of penalties against the bank and deepening one of the most serious crises to hit the bank in its 149-year history. The crisis is expected to be the main focus for David M. Solomon, Goldman Sachs’ recently appointed chief executive officer, when he announces the bank’s fourth quarter results this week. Goldman has found itself entangled in civil and criminal investigations around the world related to the work it did in helping 1Malaysia Development Berhad — or 1MDB, which United States prosecutors have alleged was a slush fund for former the Malaysian prime minister Najib Razak and other officials. New York regulators have issued subpoenas to some Goldman bankers, the bank has held talks with prosecutors about possible fines, and most recently, its lawyers in Malaysia reached out to the country’s attorney general. Last month, Malaysia filed criminal charges against Goldman Sachs, accusing the bank of defrauding investors by raising more than $6 billion for an obscure Malaysian investment fund at the heart of a scandal that has shaken Malaysian politics. Goldman Sachs has denied the charges and said that “certain members of the former Malaysian government and 1MDB lied to Goldman Sachs.” It has said it would “vigorously contest” the charges. In November, the Justice Department announced it had secured a guilty plea from one former senior Goldman banker and filed bribery and money laundering charges against a second. 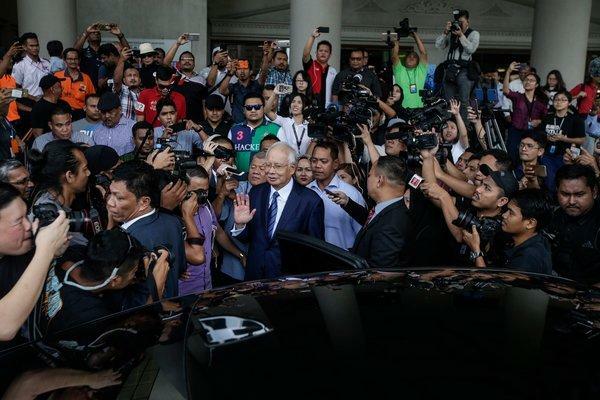 In Malaysia, the scandal has gripped the nation and led to the unexpected ouster of Mr. Najib, the former prime minister of Malaysia, handing power to Mahathir Mohamad, 93, former prime minister and longtime politician. At the heart of the scandal is the 1MDB fund which Mr. Najib created in the name of raising money for development projects to benefit Malaysians. Instead, prosecutors have alleged, billions of dollars were siphoned off into the personal accounts of Mr. Najib, other officials, and a flamboyant Malaysian financier known as Jho Low. Under Mr. Mahathir the new government is now trying to recover some of the billions that disappeared and subsequently burned a big hole in the government’s finances. He also said Malaysia would be ready to walk away from an ambitious railway project that started under Mr. Najib that was touted as a showcase deal in China’s Belt and Road Initiative, an enormous infrastructure plan financed by China that includes countries across Asia, Eastern Europe and Africa. “All options are on the table,” Mr. Lim said, adding that a decision would be made in the upcoming weeks. Last summer, Malaysia halted a contract for the China Communications Construction Company to build an East Coast Rail Link, a sprawling rail line linking vast swathes of the country, citing the high costs of the deal. Representatives from the Chinese side have been negotiating with Malaysian counterparts to revive the deal. Under the current terms, officials in Kuala Lumpur estimate that Malaysia would be making annual interest payments of 2 billion ringgit, roughly $488 million, a person with direct knowledge of the government’s estimates said. The rail, once built, is also expected to lose about $122 million a year, that person said. Last week The Wall Street Journal reported that Chinese officials offered to help bail Mr. Najib out of a growing debt hole related to 1MDB in exchange for stakes in the ECRL project and a pipeline project. Chinese officials also offered to get the United States and other countries to drop their early investigations into 1MDB in exchange, The Wall Street Journal reported, citing documents and the minutes of meetings between Chinese and Malaysian officials. CCCC did not respond to an emailed request for comment. Mr. Lim said the Malaysian government was looking into the allegations. “For us to be able to initiate any investigation, we need the documents,” he said, adding that the government had sought documents from The Wall Street Journal. The revelations could add to tensions between Malaysia, the United States and China, at a time when Malaysia is hoping to raise money through the bond market and strike new deals. The United States has grown increasingly skeptical of China’s One Belt One Road campaign, which it sees as a campaign for political influence overseas. Mr. Lim sought to play down rising tensions.